Q: On Windows 10, I am receiving a notification saying “An app caused a problem with the default app settings for .pdf files, so it was reset to Microsoft Edge” and now PDF Studio is no longer my default PDF viewer. How do I fix this? A: A recent Microsoft security update (KB3135173) has changed how default applications are set within the windows registry, and so if an older default application (windows 7 & 8) value is found Microsoft is resetting applications to their preferred Windows applications instead. This is currently affecting most application installers including (but not limited to), Firefox, BlueBeam, Gimp, etc… You can find additional information on this issue from other users at the links below. We are currently working on updating on our installer to resolve this issue. However, in the meantime we have the following workaround available. Manually set PDF Studio as the PDF default. 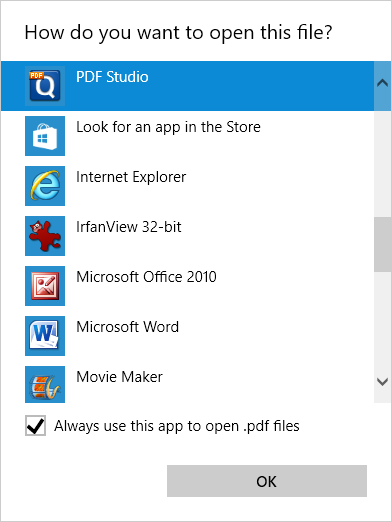 This will remain in place until either the next Windows update or if you reinstall PDF Studio. In the mouse menu, choose “Open With”. Choose “Choose default program…” in the sub-menu (last entry).